So I've been a bit busy of late. I was mentioned to a producer making a show for the BBC on body image by Lauren and Kat. Yesterday we met, and it looks like I'm going to be filmed for the part of the show focusing on body acceptance. The show is going to involve the presenter going round the country speaking to different women with different opinions about their bodies, and I'll be the last one. Speaking to the producer, it seems like they want to get a body positive message across, they're very much behind what this blog (and the many other amazing blogs out there) is about, so I'm excited (and terrified). The chance to get any fat acceptance dialogue on a mainstream television show over here would be amazing, even if it is amidst different messages. The producer knows about Big Beach Bums through her research, and has stated an interest in coming along to film and speak to us all. As I'm very concerned that the meet up remains a safe space, and that everyone is comfortable with the day, I haven't said yes. I also haven't said no, because I'd like to speak to you all in more detail about it. The producer said that they would be able to film selectively, so only the people who want to be featured would be (if this is necessary). They're interested in coming to the beach meet up, so we'd be able to shop first, chatter, and then do the filming. Basically, if anyone, for any reason, doesn't want this, I understand entirely and I won't say yes. I wanted to open up the dialogue because I think it would be interesting to be able to feature our community, but I also want any decision I make to be made with the collective consensus of the group. So, thoughts anyone? Would anyone like to be featured? Sorry for my immediate disappearance, this was attributed to a rather lovely holiday in Amsterdam and a week off, spent mainly avoiding the world and reading/knitting in parks. Somehow blogging didn't quite factor into it. Oh dear! Since the weather got a bit fancier, I have mainly been living in shorts and tees anyhow, so there hasn't been a whole amount to report. One very belated outfit today, worn to work one day last week. I'm all behind on outfits right now, because I'm packing for a holiday! Tomorrow night I'm off to see my partner in Leeds, then to Amsterdam with a friend, so all is chaos right now. Normal service will resume soon. Big Beach Bums - an update! If anyone else wants to come, please let me know, either by RSVP-ing on facebook here, or dropping me an email at fattyunbound@gmail.com. I'm collecting numbers just so I have an idea of how many of us there will be, so I can better plan the map. If you have a blog, also let me know the URL and I'll add you to the list. The itinerary is still being worked on, but will likely involve a chat/catch up, then shops, then lunch, then beach! I'll be putting the final touches to the map over the last weekend in April and first weekend in May, when I have some time off. Wide legged jeans! I can honestly say I never though I'd see the day when I gave up my skinnies. Well, I haven't at all really, but with the 70s silouhettes I'm loving for the summer I wanted another option to wear with my luxurious flowing tops (and because I love dressing like a 70s nerd, complete with flares, big glasses and a tank top. Ohhhh yes.). Dorothy Perkins have £5 off all their jeans in store and online at the minute, and after the style I wanted sold out online but appeared in a branch local to where I work, I jumped on them. These are a size 20/short fitting, which is particularly odd given that I am neither a size 20 or particularly short at 5'9"! I wore this to travel to another archive to prepare some nitrate film for scanning, which is hazardous and potentially explosive, so needless to say I was dressed for comfort and ease above anything else. Also, on a related note I wanted to say how awesome I thought this post on Corpulent was. There is a tension, I feel, in the fatosphere about posting casual outfits. As I have moved back to embracing wider legs and baggier silouhettes, I'm really interested in this debate. Is dressing up a comment on our bodies as inferior when dressed down? Obviously as a person who overdresses frequently, I don't believe this is true (I do it for many other reasons though - to amuse myself, sometimes to engender responses from others and mainly to feel fantastic in myself), however I do feel that there is a pressure on fat bloggers to dress up. This is certainly connected to the stereotype of the fat slob in jeans and tracksuits. It's a tricky balance to strike - by posting pictures of ourselves dressed up, we are refuting this stereotype, but, at the same time, I don't believe that as a fat person, I should be obligated to dress up in order to make my body acceptable or attractive to people who wouldn't otherwise deem it so. Jeans and t-shirts can look amazing on any body, and neither should cultural implications of a particular style of dress make you avoid such clothing. This is why I enjoyed fatshion february so much - it presented images of fat femmes on both up and down days - I felt like it was more of a representation of lived experiences in clothing than more formal blogs. I post the outfits I wear most days - mainly otherwise they're repeats, hideous mistakes or else I'm sat in my pajamas! This blog is about everyday dressing for me - that's why my photographs and editing are haphazard, and why I sometimes don't post huge chunks of text. I would rather there were lots of outfits updated regularly, which show how I live and what I live in as a fat woman, than more formal photoshoots (though I like these on other blogs also, it's just a personal preference). I'm always faffing on about this, but the only person I believe you should dress for (as a fat person or otherwise) is yourself. Dressing for me is a way of showing that I like my body, and before that, a strategy of acceptance. Don't dress to make anyone else happy! Wear something that makes you feel fantastic, that you love, and that fits you as well as is possible, and that you feel comfortable in. This could be jeans and a t-shirt or it could be a sequinned ballgown! I feel that wearing the right clothes for you (whatever it may be, regardless of fashion, cultural implications as a fat person or any other social pressures) is one of the most amazing things to do along the way to self acceptance and love. Just a quick post here to show off some crafting action. 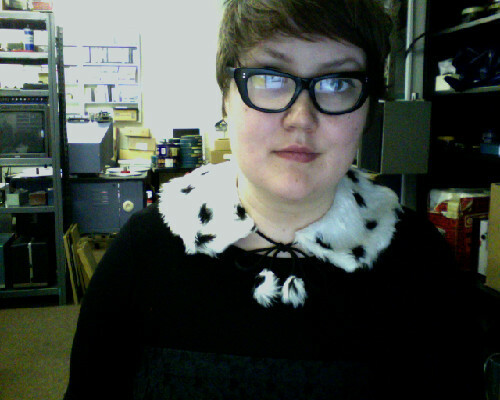 I made this Peter Pan collar out of some faux fur remnants bought for £1.30 from a local sewing shop (I have enough for another!) and some fabric scraps for lining + a 69p piece of cord bought from a haberdashery shop. The pattern I used can be seen here. It's cosy and suitably garish for my tastes. That said, it's yet to prove particularly versatile with my wardrobe, hence why I haven't posted it in an outfit yet. Some 90s gone goth gone grunge for you today, complete with bruises and war wounded knees. This was what I pottered about Brighton in last Saturday. An acquired taste no doubt, but this summer seems to be calling for bare midriffs and see through tops. With the advent of Big Beach Bums (which, by the way, there is a facebook event for here. Please RSVP! I’ve been a bit quiet on it since the initial post, this is because I’m busy looking around trying to note down options for the day. I have nearly three weeks off approaching (!) so there will be many a finite detail approaching then), I’ve had a few requests for a how to thrift post. Thrifting in size fat is always hard. I so wish the UK could have anywhere as amazing as Re/Dress or Fat Fancy over in America, but, bar wonderful events such as the Big Bum Jumble, for the main part there aren’t any places to go specifically for plus size vintage. Finding good stuff is really hard, and if you don’t have the patience in you (or the time) to rummage, then it's really hard going. I hate to start off negatively, but there are always disappointments, and what is available in plus sizes inevitably depends on what stock is in. This is hard to deal with when compared to high street/online shopping, when generally you know what is available and there is normally a way to source the items you want in the right size. Thrifting for me is embedded in my history. It comes from an upbringing with a “make do and mend” attitude, and spending my teenage years in a suburb with 10+ charity shops and very few friends and/or ways to occupy myself in my spare time. For me thrifting is inspiring, because it’s all about possibility, imagination and re-envisioning. It’s about making something amazing happen out of a finite and limited amount of resources. I don’t have magic fingers, I don’t always find something, and sometimes there are weeks on end full of disappointments. Others are so full of surprises and finds thatI almost can't believe my luck. I understand that the disappointments are maybe too much for a lot of people, but for me it's all part of the challenge. Always look. I can’t count the amount of times I’ve sworn off a store for being too pricey or never having plus size items in, then I’ve been in with a friend and found something perfect. Vintage for fats isn’t in ready supply, you can’t ever count on finding anything, but at the same time I’ve not known any places refusing to accept plus size stock, so it is available. Never pay attention to size tags. This goes without saying really, but vintage sizes =/= modern sizes. Earlier items size up as significantly smaller than their modern equivalents, and also, as with a lot of contemporary stores, some straight size items will fit much larger than they might suggest. I put them up to my body to get a sense, but you could take a tape measure to get more accurate estimates. Persist! Dig through bargain bins, through all the rails and take your time looking. Thrifting isn't really something you can do in a flash - it's something that takes time and leisure. Don't get put off if you don't immediately see anything that would fit - most vintage dresses are teeny tiny, but the options are out there. Take a friend! Take someone who is a different size to you, preferably, so you can hunt for each other as well as yourselves. Some of my best dresses were found by thinner friends with similar taste in clothes. A second pair of eyes always helps when rummaging. Look for stretchy fabrics, elastic waistbands and oversized dresses - these all fit differently on fat bodies, so you might find something intended for a smaller sized person fits you like a glove when otherwise it would be a baggy fit. Try things on! Pile yourself high with possibilities, and take chances. Try on ridiculous things. Have fun with shopping. It's harder to tell what will fit and what won't without sizing, so the dressing room is definitely your friend. For bargain hunting recommendations, check out jumble sales, car boot sales and local charity events close to you. These are my favourite haunts - as charity shops have now upped their prices (and sometimes jumped on the vintage wagon), car boots/jumbles seem to have maintained a budget ethos which I find really comforting. Go along to an event with a budget - I used to take £10/sometimes £20 in change to a car boot and just see what I came out with. Often a tenner would get me bulging bags of things, clothes and otherwise.